Another evening time photo! This one was taken at Whalers Village last night after a light rain session. I hope the remaining days for the series can focus on daylight, but a fair portion of the week has been cloudy. Actually some daylight has happened, I just didn't have Bastion with me. Whalers is one of those shopping areas with a few fancy brands mixed with common stores found in malls around the country. It's probably the second busiest shopping area with Front Street being the main attraction. * Note: I will most likely get this series on track later today with the day 4 post. 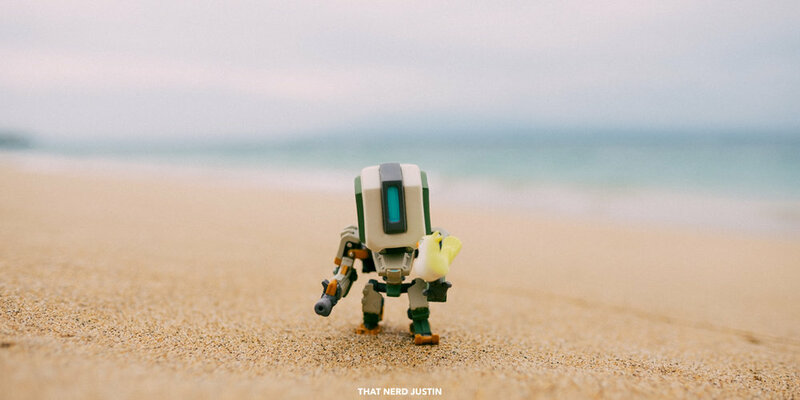 The resort I stay at is on a beach, so why not take Bastion out for some sun and waves? Years ago I learned how to basically do everything beach-y in Kaanapali. It's always nice to be back here. I know Bastion is somewhat an inexpensive toy to place in non-safe conditions, but I'm still very cautious about the safety of it (this sounds silly, but I do care for the well-being of my subjects).